Fashion is art. It inspires one to feel amazing, hold their head high and feel anew! Paper Crafting, Rubber Stamping, Crafting in general.. can do the same and more! Crafting trends, like fashion trends, often inspire great energy!! Inspired by a stunning shirt... this card came to life! DID YOU KNOW... Flower Shop (#130942 or BUNDLE IT with the Coordinating punch for a 15% discount #132726) - a favorite stamp set of mine - can be a 2-step Stamp?!?! Inspired by the outfit below... this card is very classic, elegant, trendy.... it reminds me of a beautiful elegant Asian vase. So... inspiration... OK, um, if you don't know me - I tend to stalk people in adorable outfits! I will be known to whip out my cell and take pictures.... I tryyyy to ask for permission... sigh - but sometimes I'm not in a place to do so.. so I snag secret photos.... ohhhh... lol. 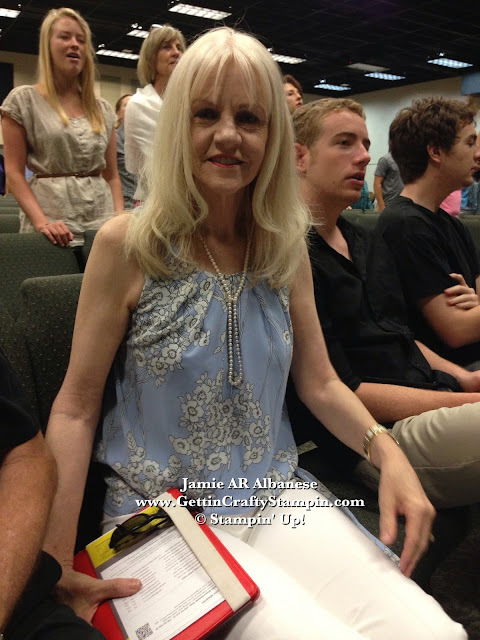 Ok this stunning lady, Janet, is from church and always wears the most lovely outfits. I did actually ask her for permission... lol... but it is sooo worth it, right?? 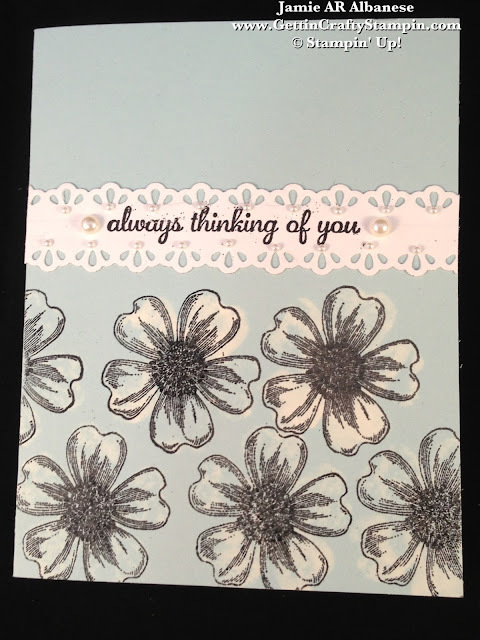 Taking Soft Sky card stock (#131203) as the base... 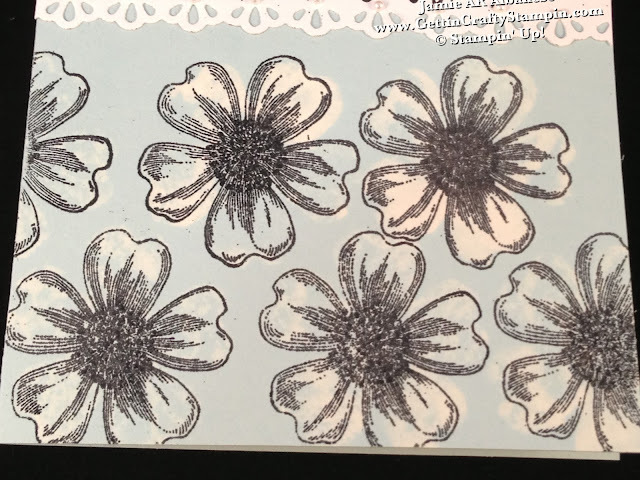 I used the Solid image in the Flower Shop stamp set with BLEACH (apply a little bleach to a napkin on a plate, use as a 'stamp pad' for your stamp). 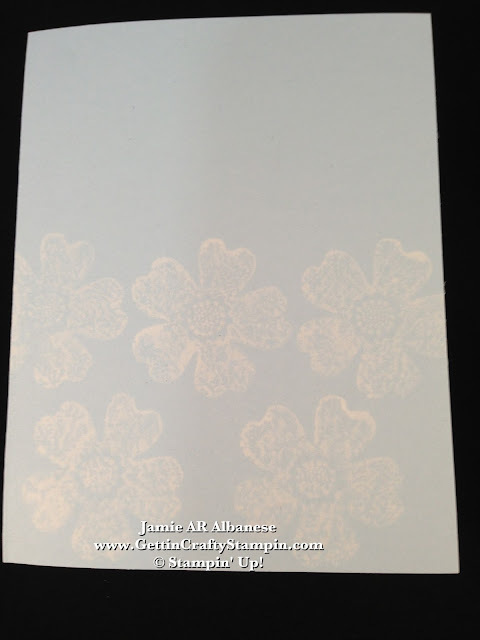 Allow the card to dry and the bleach to dry and go lighter.... it isn't always consistent but the effect is worth it. Heat Embossing allows for a sharp contrast in this 2-Step stamped look. 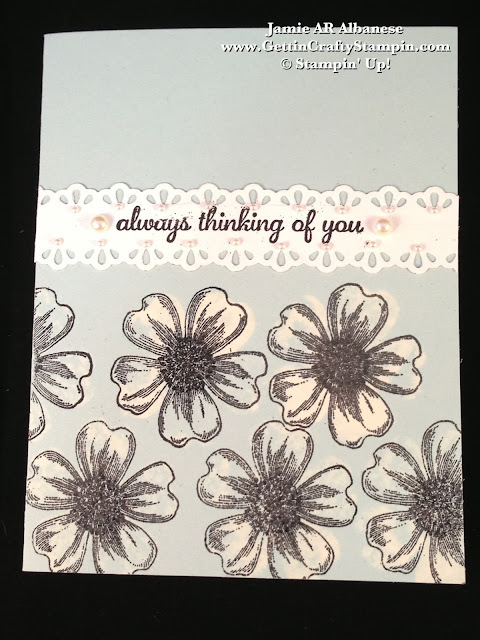 Prep the card with the Embossing Buddy (#103083) and stamp the outlined Flower Shop flower with the Versa Mark pad (#102283). Cover with Black Embossing Powder (#109133) and Heat Set with the Heat Tool (#129053). It's fun and easy to use the Finishing Touches Edgelits (#127010), Big Shot Die-Cutting Machine (#113439) and the new Big Shot Magnetic Platform (#130658) to hold it in place! The edges remind me of the flowers while giving a fun interest to the sentiment. Adding the 'pearl necklace' look with our adhesive backed Pearl Basic Jewels Collection (#119247 - 150 for $4.95 - WOW). Rubber Stamping and Paper Crafting is art. Like Fashion, it inspires one to feel amazing, hold their head high and feel anew! Crafting trends, like fashion trends, often inspire great energy!! When I'm low... I create something vivid and often feel a renewal... when I'm feeling vintage, celebratory, etc... I can create to suit or improve my mood. Like fashion, putting on a bright outfit on a dull day can really turn things around!